To see the different choices of sets and prices, please click under Material. 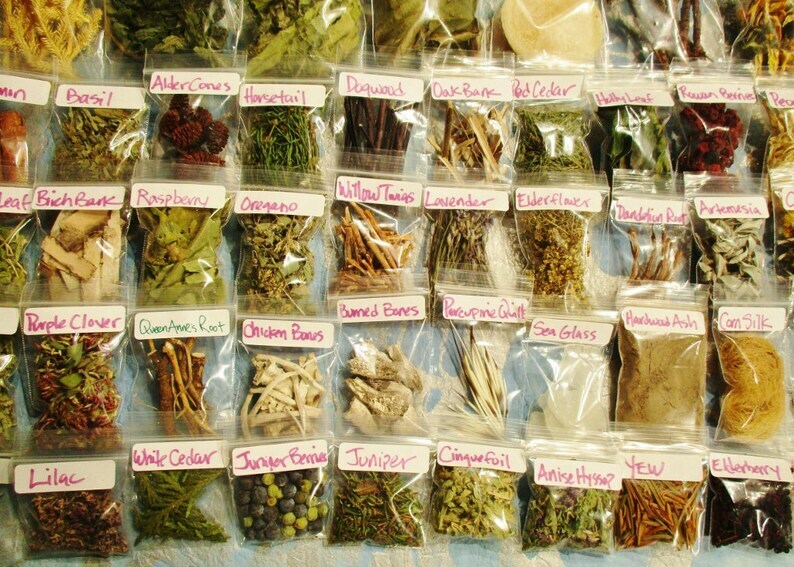 Here is a great start to your earth based spiritual practice, or a diverse addition to your existing supplies of herbs, sacred woods, spell and ritual ingredients. Many of these herbs and flowers are organically grown by me; forest and animal products ethically sourced and sustainably gathered in New Hampshire, except for the specialty items which are starred in the list below. Whenever possible these are organically grown in the US and fair trade if imported. Berries, Nuts, Cones and Pods (4th photo) contains about 15 bags from these items : acorns, alder cones, ash samaras, burr acorn caps, cedar cones, chaste tree berries, elderberries, hawthorn berries, hazelnuts, hemlock cones, larch cones, lilac pods, juniper berries, milkweed pod, rose hips, spruce cones, sumac pod, sweet gum burr, and rowan berries. Flowers (5th photo) includes about 20 items: (not all are pictured, and not all may be available depending on season) aster, black-eyed Susan, calendula, chamomile, purple clover, coltsfoot, crabapple, daisy, delphinium, elder flower, hydrangea, Joe Pye weed, lavender, larkspur, lilac, marigold, peony petals, Queen Anne's Lace, roses, St. John's wort, violets and yarrow. Animal /Mineral (6th photo) contains about 20 products (not all shown): ashes, hag stone, bear hair, beeswax, black lava salt, burned bones, camphor, charcoal chunks, chicken bones, egg shells, epsom salts, feathers, mother of pearl, pink salt, porcupine quills, sea glass, sea shells, shed snakeskin, stegodon fossil bone beads, volcanic lava stone beads and wasp paper. The vegan set leaves out all animal products. Evergreens, Mosses and Lichens (7th photo) contains about 12 products: balsam fir, red cedar, white cedar, caribou moss, club moss (wolf's claw), hemlock needles, juniper needles, pine needles, pinon pine resin, spruce needles, yew needles, usnea lichens, and wrinkle lichens. Herbs and Leaves (8th photo, not all are shown) contains about 24 items and will be selected from the following list according to availability: anise hyssop, artemesia, basil, bee balm, boneset, catnip, cinquefoil, comfrey, corn silk, dandelion leaf, ferns, figwort, fleabane, goldenrod, grape leaf, horsetail, holly, lemon balm, lilac leaf, mullein, oregano, peppermint, pineapple weed, plantain, raspberry leaf, rowan leaf, sweet grass, thyme, violet leaf, witch hazel leaf, yarrow. Wood (9th photo) includes up to 27 wood species: alder, apple, ash, beech, birch, blackberry, blackthorn, white cedar, dogwood, elder, grape, hawthorn, hemlock, holly, hydrangea, juniper, larch, lilac, maple, oak, poplar, red cedar, reed, spruce, staghorn sumac, rowan, white pine, willow, witch hazel. Bark, Roots and Thorns (about 16 items, not shown) contains barberry root, birch bark, burdock root, butchers broom root, cherry bark, cinnamon sticks, dandelion root, dong quai root, galangal root, ginger root, hawthorn thorns, lovage root, oak bark, orris root, poke root, Queen Anne's lace root, rowan bark, sarsparilla root, willow bark, witch hazel bark. Full list of 145 items- Not all items will always be available. New ones may be added. Please message me if you must have a particular item and I will check if it is currently in stock. A vegan set is available - no animal products included. If you would like to choose your own 6, 12, or 18 items, please go to this listing: https://www.etsy.com/listing/654940422/apothecary-sample-set-choose-your-own? Please consider that sometimes there might be substitutions or new additions seasonally or if products are sold out. If there is something you absolutely must have in your assortment, please message me before ordering to find out availability. Absolutely love my herb and plant sampling packets!! They help with learning the feel, smell, and look of various items used in my practice! !